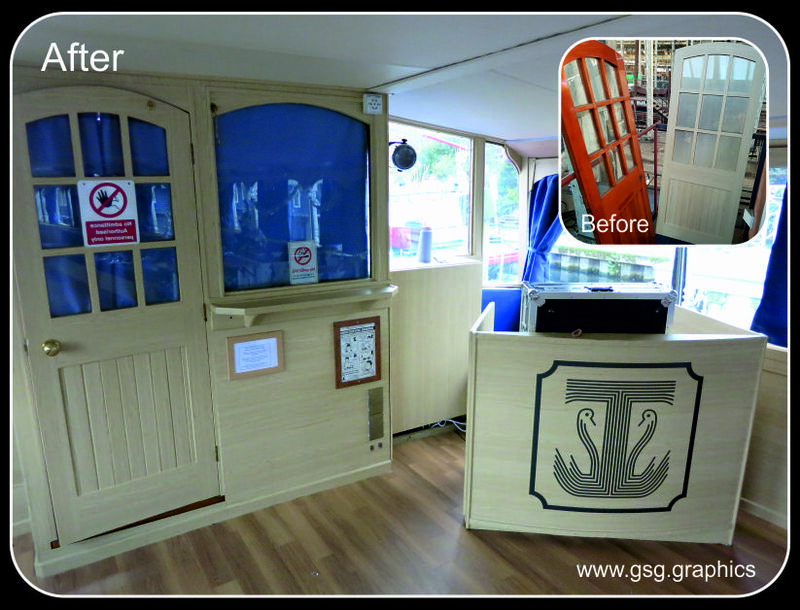 Giant Stride Graphics can offer you a clean, simple and cost effective way to modernise or renovate your boat interior surface. With over 2ooo different ultra realistic Furniture grade surface finishes are available from our supplier including woods, leathers, metallics and much more. There are many extra benefits other than a quick, clean and cost effective option which include fade resistance, water resistant, easy cleaning with long term durability. 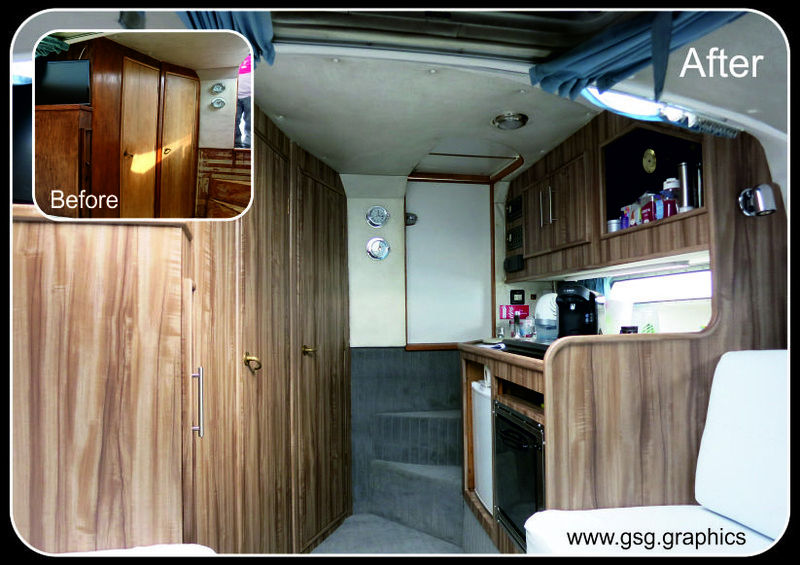 Refinishing the existing saves money in that the interior does not need removing, stripping or remaking. Giant Stride Graphics just comes along and installs the surface finishes of your choice creating your desired look at a fraction of the price. The process uses furniture grade vinyl to create your new look. 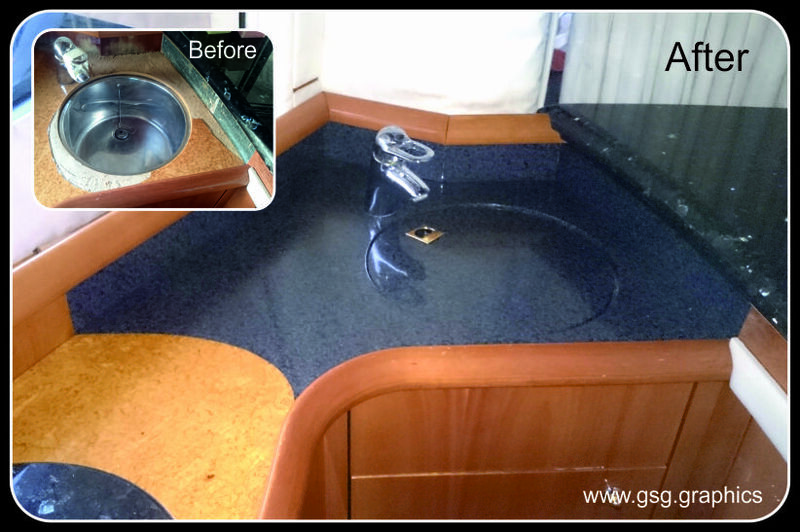 Cleanliness is key to a good install, and the process is not overly time consuming. If you live on your boat there is no reason to find a hotel, continue living there with minimal disruption. The Vinyls used are more fade resistant than the original wooden surfaces, meaning things will keep there look for longer. Being a plastic finish water is no issue, giving a good hard seal to the wood that is already there. The vinyls used are designed for interior finishing with good hard wearing surface. Whats more should you damage the surface we can do spot repairs or quickly remove the existing vinyl and replace. The vinyls wipe down clean really easily and quickly and we can also anti-bacterial versions as well.